Weaving back and forth between Henry’s past and Mitch’s present, the film shows us two completely different lives. Race. Religion. Backgrounds. Everything… And yet, the two of them come together despite all odds, and amazing friendship -which affects the lives of countless people- is born. In a poignant way, Have a Little Faith teaches us the importance of breaking down stereotype barriers and loving people- no matter what. Despite the details of the two faiths this film chronicles, it isn’t a movie about religion at all. 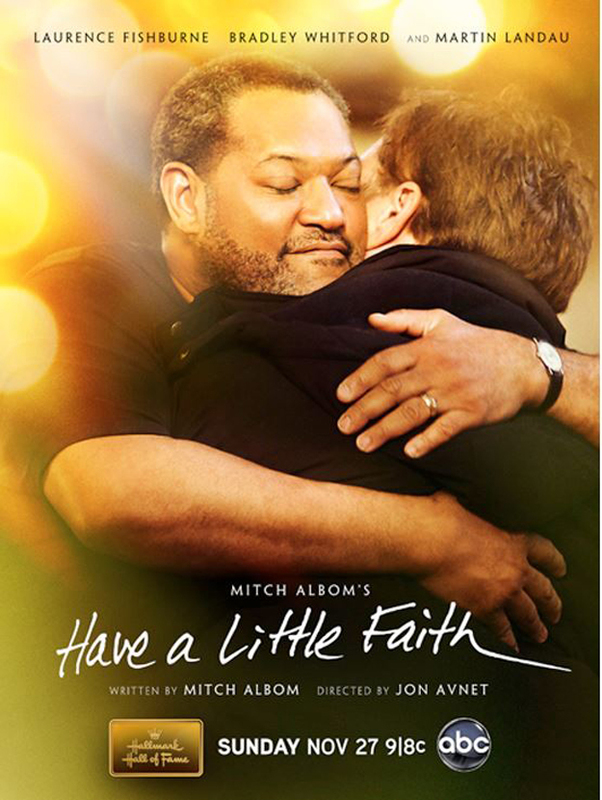 It is a film about faith in ourselves and others, a story about friendship and love… It is a true story to encourage us that it’s never too hopeless, or too late, to get up and fix our lives. It is a beautiful story full of hope and encouragement. I can’t encourage you enough to watch it when it airs on ABC, on Sunday the 27th. The story sounds interesting, especially now when there is a lot of doubt in this world…a story like this can be uplifting and just what I may need! Give it to me! Love ya! This is Jennie, btw. It wouldn't let me leave a comment with google. This actually sounds really fascinating to me! This sounds like a wonderful story! I'll DVR the movie too. I may have to request from the library. Thanks for sharing this! Don't know if I'll get around to the movie anytime soon, but I <3 Mitch Albom and I am adding this book to my wish list! I haven't read this and would love to win! You have some of the best giveaways! I love Mitch Albom. The movie looks good too. This would be such a blessing to read, and something I would truly enjoy! What a wonderful gift idea also!